Russian State Duma delegation to hold talks in India on the creation of a new political platform. 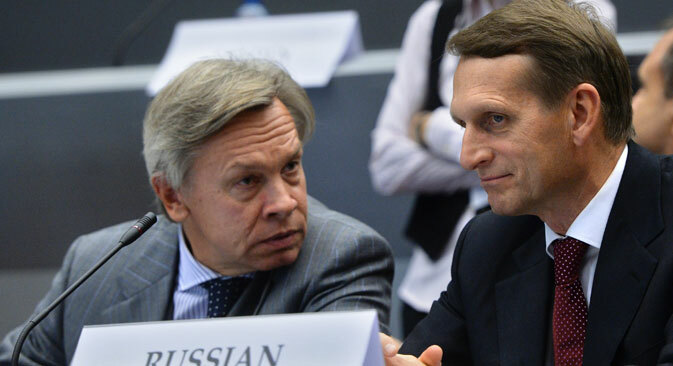 Russian State Duma Speaker Sergei Naryshkin and the Head of the Duma’s International Affairs Committee Alexei Pushkov, during their visit to Delhi on February 26-27 will propose creating a Parliamentary Assembly of the BRICS countries (Brazil, Russia, India, China, and South Africa), Russia’s Izvestia daily wrote on Thursday, February 26, citing a source in the Russian delegation. “We will start working together on the establishment of a new Parliamentary Assembly of the BRICS countries. This will be one of the points that will be discussed at the meeting,” the source told the reporter. According to Izvestia, on Thursday, Deputy Finance Minister Sergei Storchak, who is overseeing the creation of a new bank of the BRICS countries, will join the main part of the delegation. “The fact that this is the first, in recent years, visit by the Speaker of the State Duma to India, says much about its significance. This is an important event for both Russia and India in the further development of our relations, including within the framework of the BRICS. We will begin working on the establishment of a Parliamentary Assembly of the BRICS countries. This will be one of the points that will be discussed there,” Izvestia learned, on the eve of the visit, from the State Duma. Until now, inter-parliamentary relations between India and Russia have not been as active as those in the military cooperation sphere have been. Back in November 1998, a Russia-India inter-parliamentary commission, composed of parliamentarians from both countries, was established. It held its first meeting in 2000 in New Delhi, the second – in 2003 in Moscow, however since that time, its work has been hardly noticeable. The visit of Sergei Naryshkin should compensate for this, and it not by chance that his program includes not only a meeting with the Speaker of the Lok Sabha (Assembly of the People) Sumitra Mahajan, at whose invitation he is visiting India, but also talks with President Pranab Kumar Mukherjee. “We intend to strengthen and give new impetus to inter-parliamentary cooperation within the BRICS,” Head of the State Duma International Affairs Committee Alexei Pushkov explained to Izvestia. The most important steps in joint collaboration, which are bringing the BRICS countries together, are their common positions on a number of international political issues, including Libya, Syria and Afghanistan, Iran’s nuclear program, as well as financial and economic issues – the reform of the World Bank and the International Monetary Fund and the establishment of the BRICS Exchanges Alliance. ICS Development Bank, designed to finance infrastructure projects and sustainable development projects in the BRICS countries as well as in developing countries. On Tuesday, the Federation Council of the Russian Federation ratified the decision on the establishment of this bank. The volume of its assets has been established at $100 billion, of which dedicated capital is $ 50 billion, paid up capital – $10 billion (payable “on demand” – $40 billion). The first president of the bank should be a representative of India, the first chair of the board of directors – representative of Brazil, and chair of the board of governors – representative of Russia. Another important structure in the BRICS could become the new Parliamentary Assembly of the BRICS countries, the ​​creation of which will be promoted in India by the Speaker of the Russian Parliament. “We have a long-standing cooperation with India, and thus the emergence of a new parliamentary structure for the BRICS – is a great idea. India is one of the key countries in BRICS, so a visit by Mr. Naryshkin will contribute to the creation of this new structure. The Speaker of the State Duma knows how to negotiate, and has great experience in such talks,” Izvestia was told by Deputy Chair of Duma’s International Affairs Committee Leonid Kalashnikov. This visit by the Russian delegation is very important for both cooperation between Russia and India, and work in the parliamentary format of the BRICS, considers Deputy Chair of Duma’s International Affairs Committee Alexander Romanovich. “Relations between India and Russia, even during the Soviet era, have always been at a good level and characterized by their diversity and versatility, including in one of the most important areas – military cooperation. I cannot even think of any other country that such cooperation can be compared to. Therefore, I believe that parliamentary cooperation between our countries will also develop at the same high level, which is also important,” said Mr. Romanovich. “This visit is destined to result in great political success. One reason for this is the already long-established cooperation between Russia and India, which we consider as our strategic partner. We can say that Russian-Indian cooperation is not affected by any volatile winds,” considers Ambassador Extraordinary and Plenipotentiary, State Duma Deputy Vasily Likhachev, who noted that the combined strengths of Russia and India would benefit not only the Asian region, but also the stability of the world order in general.